When we launched Liquidware Labs, almost five years ago, there were challenges and gaps in VDI platforms that you could drive a truck through. Only the hardiest of early adopters were willing to undergo the pains of rethinking, re-learning and re-architecting new ways of delivering Windows workspaces. In 2009, VDI was not only hard to do, it was also extremely expensive, and after all the effort and cost, the results were often less than spectacular. Far from getting the robust and streamlined provisioning and performance out of their VDI systems that they expected, many organizations incurred cost overruns and roadblocks which stalled their projects. And that’s where Liquidware Labs came in. From the beginning, we advocated doing VDI right from the outset – actually even before the outset – of your project. We not only strongly established assessments of physical desktops as the best starting point for all VDI projects, we invented an automated means for doing so with high levels of accuracy – i.e., our Stratusphere FIT solution. For us, it was obvious that you had to know what you had and know what you use, and based on those observations — and the specific problems you were trying to solve – determine what you need. Stratusphere FIT was an instant success…..5 million desktops later …it remains the pre-eminent VDI assessment solution used worldwide. Later as customers scaled up and hit roadblocks, we stepped in with Stratusphere UX to automate a Health Check methodology (which we invented) and to validate VDI user experience. Again, 5 years later, we have 100% success rate in helping customers identify root causes of VDI performance issues and getting their VDI projects back on track, but more importantly making them scalable. Today, VDI monitoring is recognized as an accepted need to diagnose, troubleshoot and optimize VDI projects. Whether stand-alone or married to a systems monitoring tool, Stratusphere UX represents the single-best-in-class user experience monitoring tool both for quality of desktop metrics and relative ease of use. Last, but certainly not least, ProfileUnity. When customers moved to non-persistent stateless VDI to solve storage issues, ProfileUnity solved their biggest problem by providing robust user management and personalization to non-persistent desktops. That gave our customers ease of provisioning, along with a more manageable architecture, and more manageable costs. Their end users could have desktops that were exactly like their old legacy PCs. Migrations to future Windows OS were a breeze, no matter what the platform was. And that pretty much takes us to the present, which makes me thoughtful, and now I want to put this all in a fresh context. While Liquidware Labs – and a lot of other folks – spent a great deal of time in the weeds getting VDI deployments right — what we were all doing in reality was figuring out ways to deliver user workspaces better. VDI, Cloud, DaaS, AppVirt, AppStreaming, Data in clouds, User Environment Management, IOPS, etc – were all point approaches we could focus on in order to learn how to deliver a better, more productive user experience. And that is the high order bit in all of this. It’s not about CAPEX; it never was. Its more about OPEX, but practically speaking, the greater concept here is that we are literally reinventing desktops, how they are delivered and how they are used. It is all about productivity. Remember why we gave up typewriters for something far more expensive and harder to manage? In early VDI, we kind of brute-forced VDI implementations, getting it to work by throwing dollars at the project. In the future, refinements will increasingly need to be made with the scalpel. Which means you need granular visibility into your desktop systems, resources, applications and users in order to get the magnitude of order changes for the dollars invested. You cannot manage what you cannot measure. So the math becomes about the highest possible productivity for the users, staff, and budget, for the most people possible, with the greatest density that allows the previous to all happen. And this means not recreating the past (i.e., making Virtual Desktops just a replacement for Physical Desktops), but wringing out even the smallest efficiency gains that are possible to exploit in the gamut of virtualization technologies. Which strangely enough brings us to IOPS. IOPS. Wow, if there is a buzzword in the desktop virtualization industry these days, its IOPS. No wonder about that. From the beginning, storage presented the biggest cost and biggest potential roadblock in VDI projects. Today, there are no lack of solutions out there that attempt to bend the laws of physics and allow us to handle the random, volatile, and unpredictable nature of what our users will do on these denser and denser, centralized hardware we choose.There are even some solutions that shall remain nameless that add to this problem. A notable Stanford Computer Science course I audited a while ago kept harping on this notion of AMAT (average memory access time) when architecting computer systems and how vitally important this is. The cool thing is we have a number of tools to chase this holy grail. We have SSDs, caching, more and faster memory (thanks Kingston), novel inline IOP reordering, reduplication, etc. Moore’s law has been so kind to all of us with processors capable of unimaginable compute. But the fastest processer can only compute as quickly as you get the data there. Follow the wire – there are still bottlenecks we have previously overlooked. So, the guys in our Labs here at Liquidware Labs rolled up their sleeves, and seeing as we are in the business of both Delivering Portable User workspace STATEs (ProfileUnity, FlexApp) and measuring user productivity and the systems that support it (Stratusphere FIT and UX), we challenged ourselves to do it again. Adhering to our founding principles – deliver enterprise software, that is simple, scalable, complementary to the major hardware and software platforms from hypervisors, to brokers, to hosts, to storage – and properly priced, we wanted to tackle the problem of data to the CPU faster. Flex-IO is IOPS Acceleration technology for non-persistent VDI including both VMware Horizon View and Citrix XenDesktop environments. 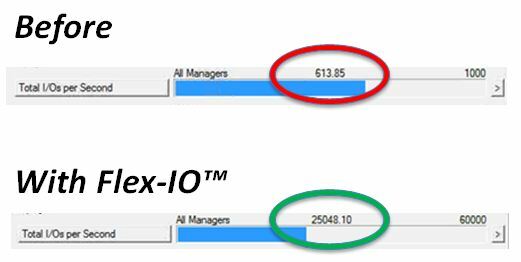 Flex-IO leverages VMware ESXi host RAM and compression to accelerate IOPS to approximately 25,000 or more per host. The solution efficiently uses host RAM, as little as 32GB per 100 users, to accomplish an average 40x increase per host! Furthermore, RAM requirements for Flex-IO are approximately 50 percent the requirements of other IOPS accelerator solutions on the market, making Flex-IO implementation very cost effective. Compatible with non-persistent/stateless VMware View, Citrix XenDesktop, Dell Workspace Management desktops running on VMware ESXi servers. We openly invite all you IT Pros to grab a free copy for your lab – and take it for a spin. Please complete this form if interested in participating in the phase two BETA program for Flex-IO. The only promise we make is that if you give our solutions a try, we will work tirelessly to truly deserve your business. After quarter after quarter of record results, I will conclude by simply saying….Thank you!